Multiple ongoing displacement crises and several new ones characterised 2017. As a result, the global population of forcibly displaced people increased to 68.5 million, compared with 65.6 million in 2016. Significant new displacement, affecting millions of people, was seen in particular from the Democratic Republic of the Congo (DRC) and Myanmar as well as continuing displacement due to the Syrian crisis. The past decade has seen substantial growth in the global population of forcibly displaced people. In 2007, this population numbered 42.7 million; over the last 10 years, this figure has increased by over 50 per cent. Today 1 out of every 110 people in the world is displaced, compared with 1 in 157 a decade ago, with much of this increase having occurred over the last five years. While the Syrian conflict contributed significantly to this increase, there have been other major displacements throughout the world over the last five years, notably in and from Burundi, Central African Republic, the DRC, Iraq, Myanmar, South Sudan, Sudan, Ukraine, and Yemen. 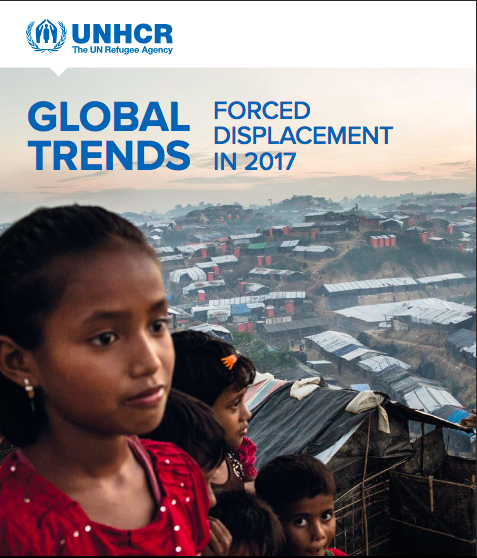 The UNHCR report on FORCED DISPLACEMENT provides a detailed overview of global trends concerning displacement in 2017.